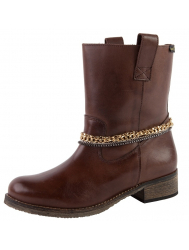 Finesse and Elegance: This stylish boot bracelet has an elegant braid with a mix of different materials and colors. 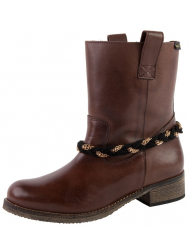 Discreet, the three laces that make up this boot bracelet are shades of brown and cognac. A golden chain with subtle and discreet rhinestones pulls the look together. Feminine Dynamics: This pair of warm-colored, stylish bracelets is the ultimate accessory to personalize your boots. Very unique, the press-studs placed all along the strap to compliment the rhinestones make this a lively piece full of life and energy. Feminine and Stylish: just a hint of flirtatiousness. Very stylish, this bracelet offers a personal and original touch to your outfit, suitable for any occasion, from work to nights out. The Mery boot bracelet adapts to your shoes and works in harmony with your outfits. Strapped in Chains: Chic and delicate, these gray, silver and golden boot bracelets are elegant with just a hint of character. The mix of colors and chains add personality and originality to any boot. Ideal for going out, Alzanga’s Andrea boot chains can be worn crisscrossed or parallel to each other, depending on your outfit and your mood. The Feminine Adventure: The Emma boot bracelet’s design gives off a rocker-style vibe. With 3 rows of electric-colored buttons, this boot bracelet reinterprets fashion, offering women the opportunity to assert their rocker, adventurous side. My Secret Boot: Made with a golden chain that serves as a base and then evolves into multiple chains (some of them silver), this boot bracelet is extremely original. It can be worn on the side or on the front. Alzanga’s Sarah model has everything you need from your jewellery: a touch of elegance for your boots, no matter what color. Chain Reaction: Made with a silver chain that serves as a base and then evolves into multiple chains (some of them golden), this boot bracelet is extremely original. It can be worn on the side or on the front. Alzanga’s Mya model is unique, and adds a touch of elegance to your boots, no matter what color. Secret Boots: With a modern, contemporary design, the Irina boot bracelet model is made with golden/silver/steel grey rectangular pearls, making it perfect for adorning most boots. Delicate and graceful, this fashion accessory for boots found at Alzanga gives you a look that adds a pop of creativity to all your outfits. Unraveled Chains: This energetic combination of colors and small knots give this bracelet unparalleled gentle esthetics. Original and refined, the Eva boot jewellery can be paired with many different colored boots, for a night out or for an everyday look. The Feminine Adventure: Refined and elegant, this boot bracelet inspires charm and finesse. Very trendy, they go well with your everyday boots as well as your going out shoes. Refined Boots: One word sums up this bracelet – elegance. It brings together three boot bracelets that can be worn for any event and any color of boot, with a dress or pants. Flirtatious spirits will appreciate the mix of golden chains and black ribbon intertwined between small loops, adding chicness to any outfit! Button Up Those Boots! The mix of colors in the buttons on this bracelet allows it to be paired with all different colored boots: beige, brown, grey or black. This boot jewellery adapts perfectly to any outfit and any style, adding a chic yet laid-back touch. A Touch of Feline: These shoe bracelets add a touch of feline grace and charm for a look that will be sure to turn heads. Very original and fashionable, they are perfect for a pair of black boots. The golden buttons and rhinestones add a touch of fantasy to the look. Dare to wear! Boot Braid: The Celia boot bracelet model featured on Alzanga is made from a delicate black and gold braid that accessorizes your boots perfectly for a surprising, unexpected effect. For a night out or everyday wear, this shoe jewellery is ideal to add a pop of personality and sophistication to your look. Lace Up Your Boots: This boot bracelet has an elegant steel grey colored lace paired with grey stones will add to your uniqueness and personality. This model of jewellery is perfect on a pair of black boots, amongst others! It is the ideal finishing touch for your outfit. My Boots Have Wings: This unique design is made with delicate chains that have a wing in the middle, giving your outfit a look that is both elegant and fit for a rocker. Very original, this bracelet is perfect for personalizing your outfits. Wear it anytime! Rock My Boot: Personalize your outfit with this pair of boot bracelets with a rocker look that will be sure to highlight your strong character. They are perfect for an everyday look when worn over ankle boots or booties, and add a head-turning element to any heeled boot worn for a night out.